Home » Tech Tips » Windows 10 » How to Manage Tablet Mode in Windows 10? 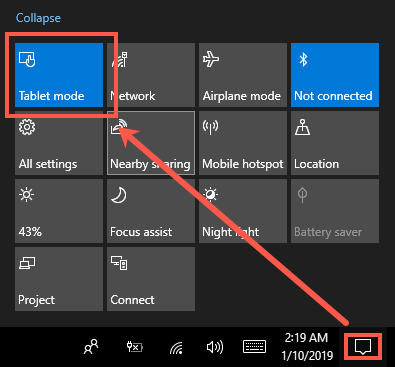 How to Manage Tablet Mode in Windows 10? The Windows 8 was introduced with a Start screen in place of a desktop and a Start Menu. Many PC users didn’t like the new feature which seemed more of a frustration for mouse and keyboard input. In Windows 10, Microsoft reintroduced the Start Menu/desktop mode and included the tablet mode feature, which enables users to switch to the full Start Screen display. Just like in Windows 8, the tablet mode in Windows 10 hides desktop displays Start Screen with tiles that you have pinned to start. Additionally, it opens apps in full-screen making it friendlier to users with touch-enabled devices. Switching between the tablet mode and the full-desktop mode in Windows 10 is easy and straight forward. This article will take you through how to enable, disable and personalize the Windows 10 tablet mode. In order to switch to the tablet mode, click the Windows Action Center icon on the notification area of the taskbar, located at the bottom-right corner of your screen. This will slide up the Action Center display on the right edge of your screen. At the lower “Quick actions” section, look for the icon for “Tablet mode” and click it to turn on. The box will turn from gray to blue. To turn off the tablet mode, click on the Action Center icon in the notification area and click on “Tablet mode” from the quick access list. Now the tile will turn gray and Windows will take you back to the full desktop display mode. The tablet mode shows some icons on the left edge of the screen and modern Microsoft Store’s apps and pinned tiles on the main pane. Click on the first icon at the top-most right corner of the display (three horizontal lines) to expand the Start Menu. The second icon from the top displays the tiles and apps (default Start screen). Clicking on the third icon (the list icon) will show a list of all apps with the recently added or most used apps at the top of the screen. The first icon from the bottom is the “Power” button from where you can shut down, restart or hibernate the computer. 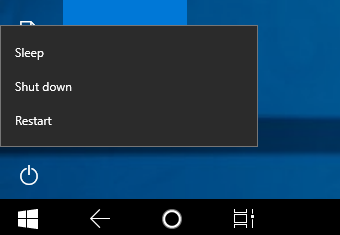 You can customize the tablet mode display under Windows 10 Settings app. In full desktop mode, go to the Windows Start Menu, select the “Settings” icon to access the settings app. In tablet mode, click the gear (settings) icon on the lower left side of the screen to open the app. Go to “System” settings, the first on the settings app list. On the left pane of the system settings window, click on “Tablet mode” to see the various settings on the right panel of the window. 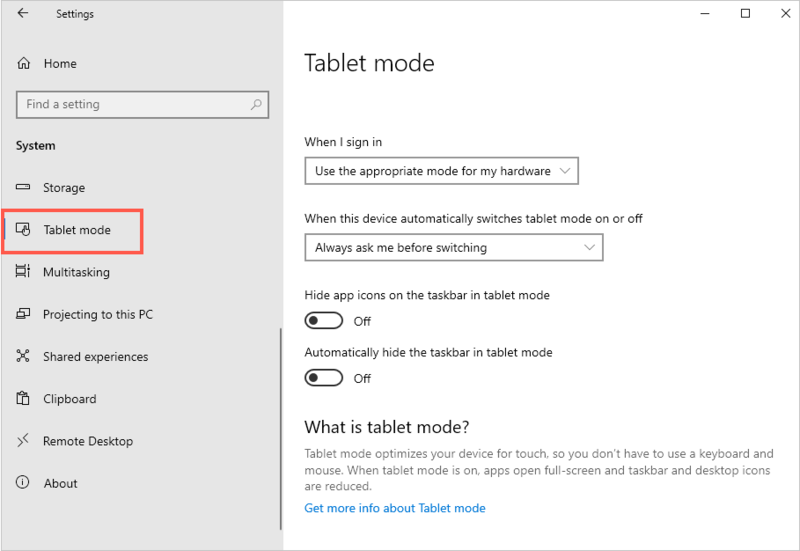 There is another way of accessing the tablet mode settings in both desktop and tablet modes. 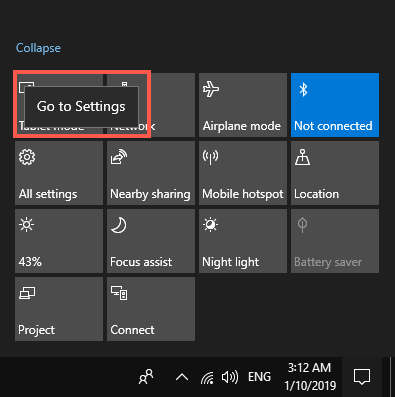 Click the Action Center icon on the taskbar and on the Quick Access list, right-click the “Tablet mode” then click on the “Go to settings” link. Click the dropdown box below “when I sign in” heading to expand the list, pick your preferred option for signing in with tablet mode. If you select “use tablet mode” Windows will always load in the tablet mode. When you are using a 2-in-1 device which can automatically switch the modes, you can control the automatic switching. “Always ask me before switching” – Windows will always ask you to confirm the switch. “Don’t ask me & don’t switch” option – Restricts Windows 10 to work in your manually set mode. Don’t ask me and always switch” – Windows will detect hardware changes and swaps the modes appropriately. You can hide or show icons on the taskbar as well as automatically hide the toolbar in tablet mode. To do so, toggle to turn on the switch under the two options. Alternative you can use the shortcut method to hide or show taskbar or app icons in tablet mode. Right-click an empty space on the taskbar. If the taskbar is set to hide automatically, take the cursor to the bottom edge of your screen to show the taskbar. 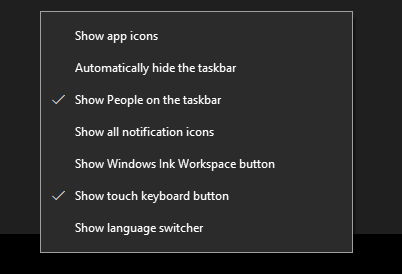 From the list, check or uncheck “Automatically hide taskbar” option. Taskbar will be pinned to the screen or hidden when the mouse focuses elsewhere. 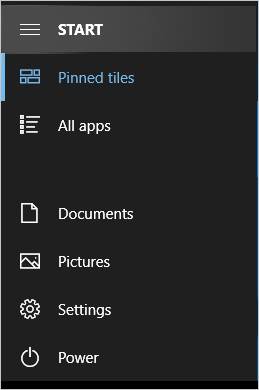 “Show app icons” – Windows app icons will appear or disappear from the taskbar. In summary, the tablet mode feature in Windows 10 is a great addition to optimize usage for touch devices. This feature brings the Windows 8 Start screen experience without forcing it on the users. Furthermore, switching to and personalizing the tablet mode manually is simple and you can follow the above guidelines for complete the task.